Please remember that only one program can be connected to the printer! Repetier-Server runs even on small and cheap PCs like Raspberry Pi, … with Linux, Windows and Mac. Of course you can run Repetier-Server on the same machine as Repetier-Host. You can control your printer even from your smartphone and tablet und see via webcam, what the printer is doing. Full flexibility – Access and control your 3D printers from anywhere. You get rendered preview images for all stored G-Codes. The print continues even when the Repetier-Host is closed. 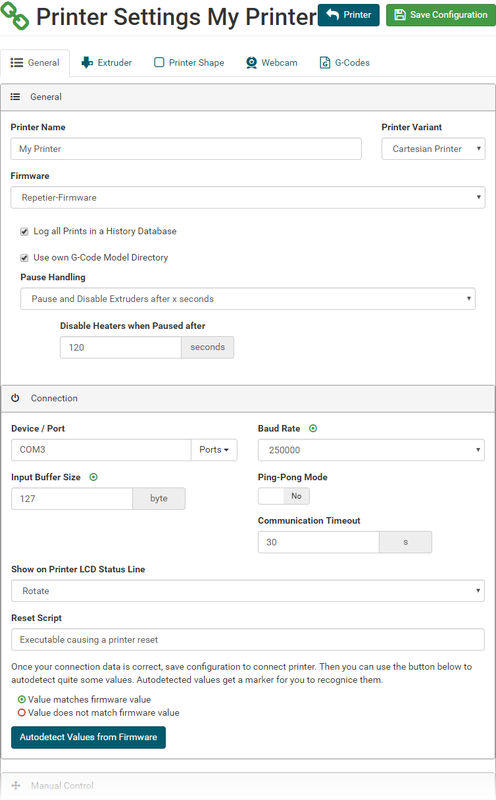 Multi printer support – Repetier-Server connects and prints on multiple printers simultaneously. First you should install and start Repetier-Server, after that you can connect Repetier-Host to Repetier-Server. Open Repetier-Server in your browser. The URL is http://localhost:3344 or http://ip-address:3344. The easiest way to set up a new printer is to upload an existing config file. Go to and click on Upload Printer Configuration. Enter a printer name, select the configuration file and click Create Printer. That’s all. Maybe you must select the COM port. To set the port, select your new printer on the left side and go to Settings -> Printer Settings. 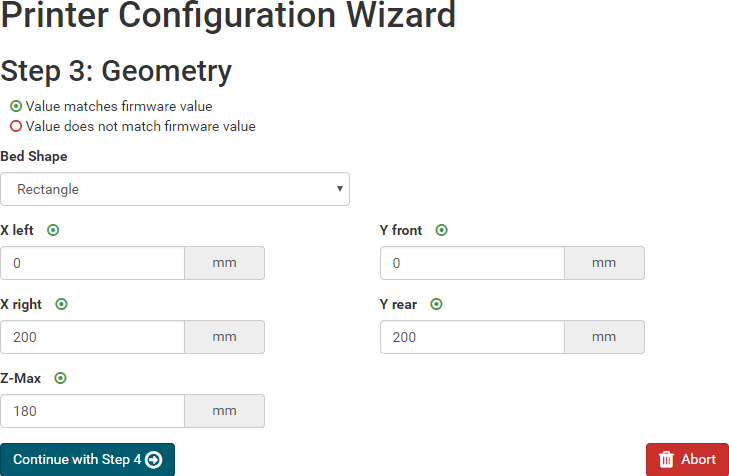 Another very simple way to add a new printer is our Configuration Wizard. Go to and click on -> Add new Printer. In the first step you just have to enter the printer name and click Continue with Step 2 . Here you have to select, which firmware is used, you have to set the Device / Port. The boud rate can be set to autodetect, which will test the typical rates. In case autodetect fails, you have to set it yourself. how many bytes the firmware can store, before the firmware buffer overflows. All known firmwares support at least 63 bytes. AVR based firmwares normally support 127 bytes. Click Continue with Step 3 to connect the printer. detected values. In the following detected values are marked with grene circles. Here you can set the dimensions and bed shape of your printer. Then click Continue with Step 4 . Set the number of extruders and the filament diameter. Typical filament diameters are 1,75 mm and 2,85 mm. Then click Continue with Step 5 .
with software command. Then click Finizsh Wizard . That’s all. 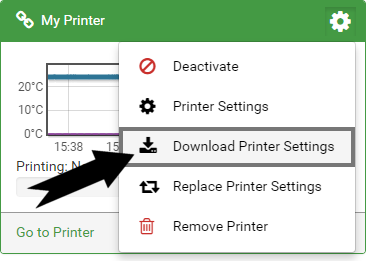 from your Dashboard at Actions -> Printer Settings. Here you can set all printer related parameter. So it is a good idea, to check these settings once your printer works. Save Configuration. If you leave settings without saving, you will get a security question to prevent accidential data loss. For parameters which may be difficult to understand you get a popover with detailed information when you click on the text field. Here you find a manual how to set up a webcam in Repetier-Server for Windows, Linux and Mac. 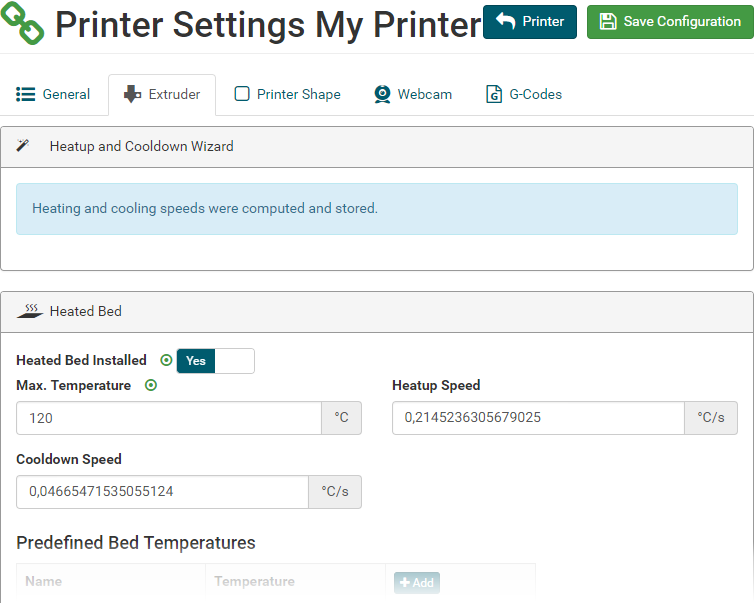 To calculate exact printing times, you should run the Heatup and Cooldown Wizard. This feature measures heating and cooling speed needed for accurate printing time prediction. 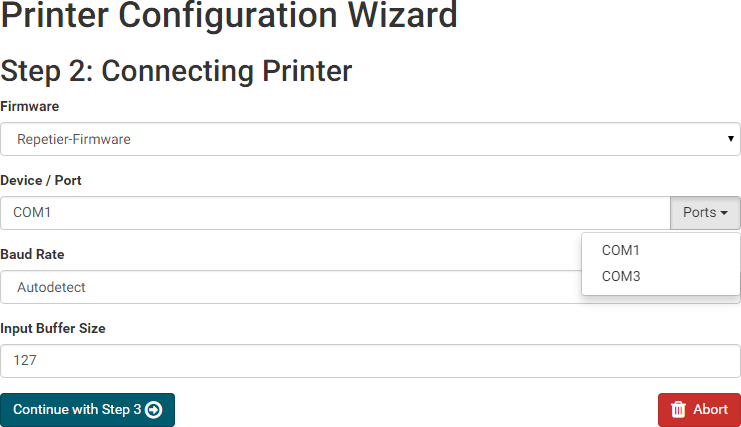 Go to Settings -> Printer Settings -> Extruder and click Start Wizard. Make sure your printer has power! Then enter the temperatures for extriders and beds, then click Start Measurement. Now you have to wait. The wizard tracks the warming and cooling speeds, which will take some time, especially the cooling of the bed is time intensive. When sou see Heating and cooling speeds were computed and stored., the wizard is ready. The exact values for Heatup Speed and Cooldown Speed are stored autamatically. First we need to get the API Key from Repetier-Server. Open Repetier-Server and go to -> Global Settings. Copy the API Key to the clipboard. Open Repetier-Host and click Printer Settings. Printer: Enter your printer name. Connector: Select Repetier-Server as Connector. IP Address: Enter localhost or the used IP Address. API Key: Enter the saved API Key from the clipboard. 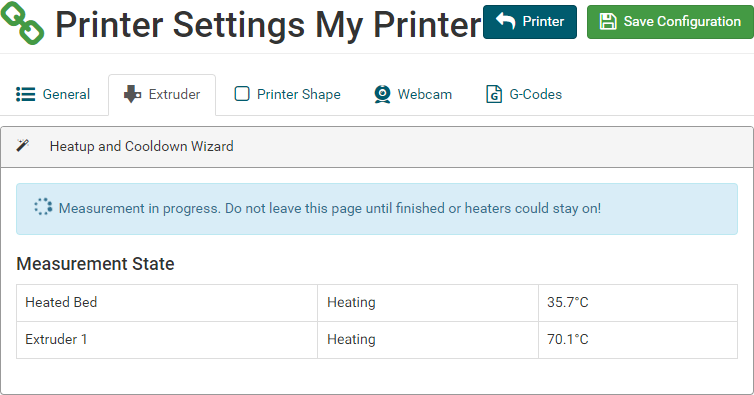 Now you can select your printer from the printer list and the click Copy Server Config Settings. Repetier-Host will import the most settings from Repetier-Host, so this is quite easy. 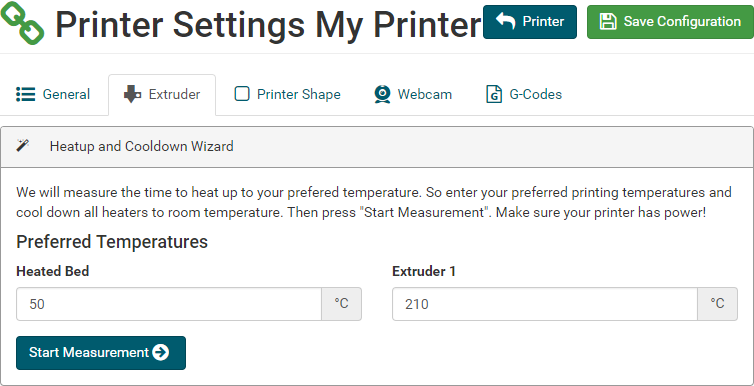 Now you can check the printer and extruder settings and click OK.
Now you can Connect/Disconnect your printer in Repetier-Host to the server. If you disconnect your printer in Repetier-Host, the printer will still be connected to Repetier-Server. When the printer is connected you can slice and print regulary (you can close Repetier-Host once the print job has started without stopping printing), but you also have the opportunity to upload the G-Code to Repetier-Server, to use it again and to get rendered preview images. Just click Save to Server. Of course also the Manual Contol will work as used. If the printer is connected via Repetier-Server, you will get the new tab Server. Here you can see your stored G-Codes. When you mark them, you will get the preview image and you can start the print job. While printing you can stop or pause the print and get some printing informations. If you want to connect Repetier-Host directly with your printer, you should use the serial connection. To communicate with your printer, you first have to select the correct port. If you plug in the usb cable while this dialog is open, the port dropdown list will update automatically, so that the added port will show up. After that you have to set the correct baud rate. 95% of all printers use 115200 or 250000. It is very important to use the correct baud rate! After that you can enter the other settings. The receive cache size is nearly always 127. If you get many communication errors while printing, you might need to go down to 63. If you want to connect your printer via ethernet without Repetier-Server, what we recommend, you can choose TCP/IP Connection. This will send the same data as it would with serial connection. Except IP Address and Port, which must match your printer, the settigs are the same as for the serial connection.